As has become my custom, I drove through the Rocky Mountain Arsenal National Wildlife Refuge on the morning after my last shift at work this past week. It's a lovely way to start my days off and helps me make the transition from working nights to a day schedule. It had been a couple of weeks since I last visited. What a transformation! 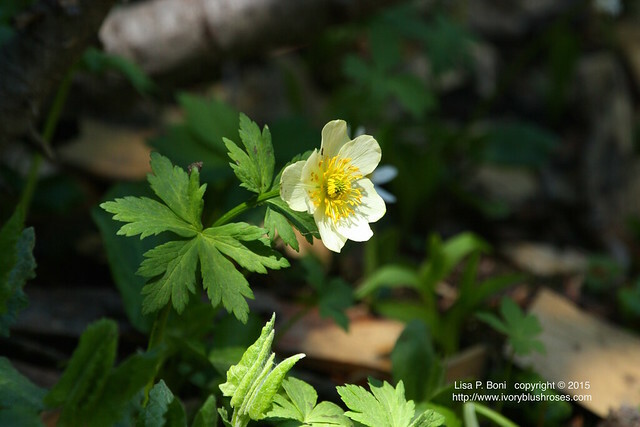 So many wildflowers in bloom and trees which were just thinking about leafing out were now in full leafy splendor! 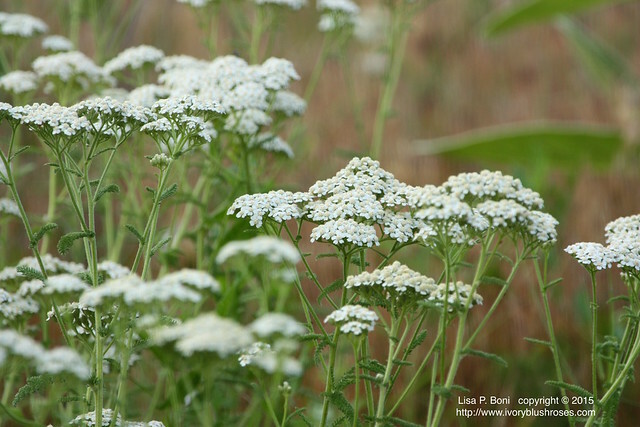 The wild yarrow was especially lush and beautiful. 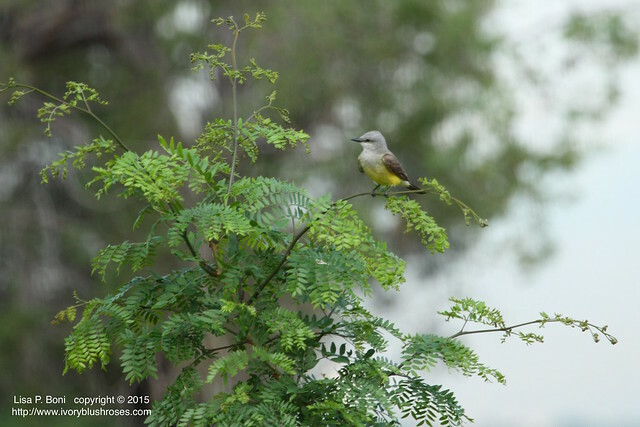 Throughout the Refuge, the Western Kingbirds were abundant! Such beautiful birds! 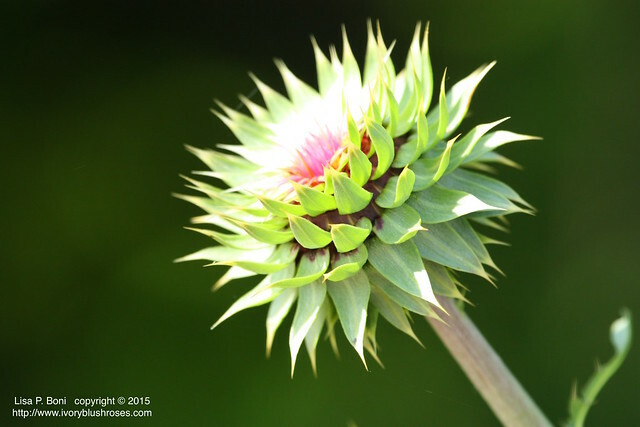 The Bull Thistles have an architectural beauty to them. Stunning. 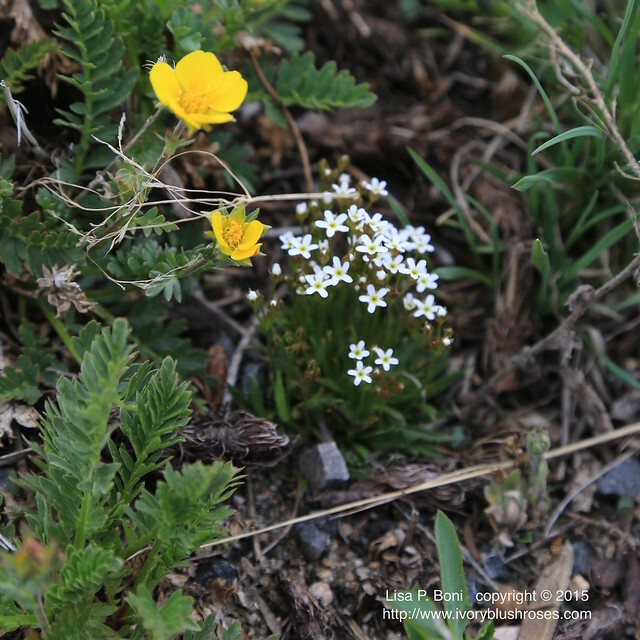 It's too bad that they are also considered a noxious weed as they can take over huge patches of ground rendering it unfit for anything else to grow. The tiniest bit of root left in the ground will take hold to create many new plants. I've dug and dug and dug more than my share of various noxious thistles out of the yard of every house I've lived in here in Colorado. Beautiful, but difficult! 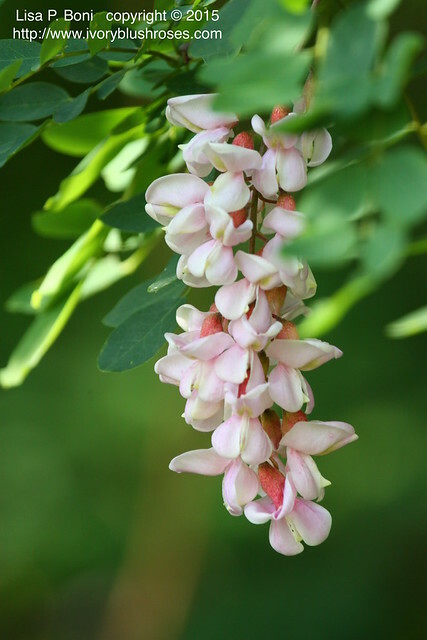 All around the Refuge, there are thickets of short locust trees. What a delight to see them festooned with these beautiful sprays of pink flowers! 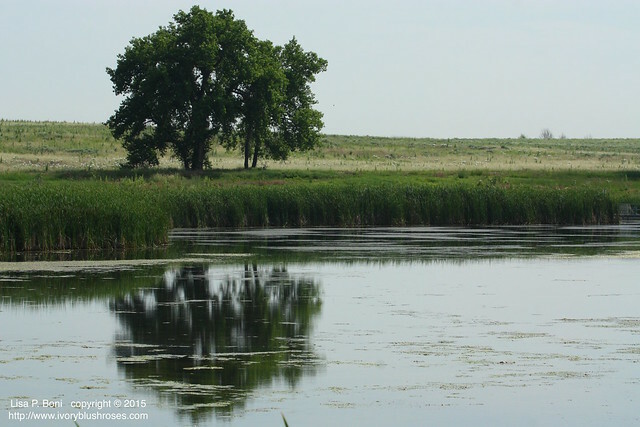 There are several large and small ponds on the refuge. In winter, they were filled with a huge assortment of waterfowl. Now they are quiet for the most part, hosting swallows and redwing blackbirds primarily. 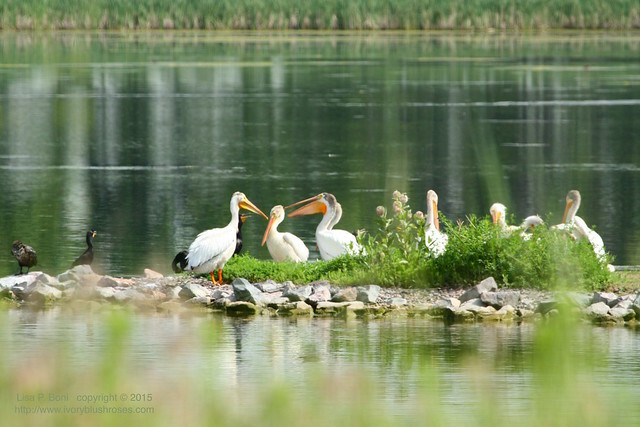 On one lake however, there is a contingent of American White Pelicans and several Cormorants. When I look at Pelicans, it makes me in awe of the creative talents of God! For such large ungainly birds, they land with hardly a splash and to watch them fish in a flotilla is a ballet of grace and beauty! 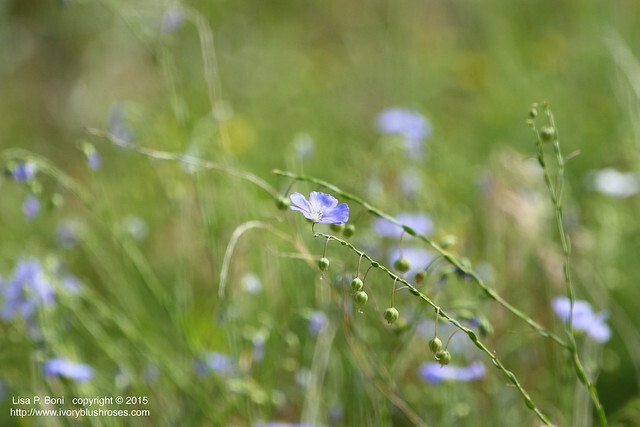 Wild flax is abundant in the grasslands of Colorado in the spring and early summer! Such ethereal beauty! I'm not sure if this is a female Western Kingbird or another variety of flycatcher. 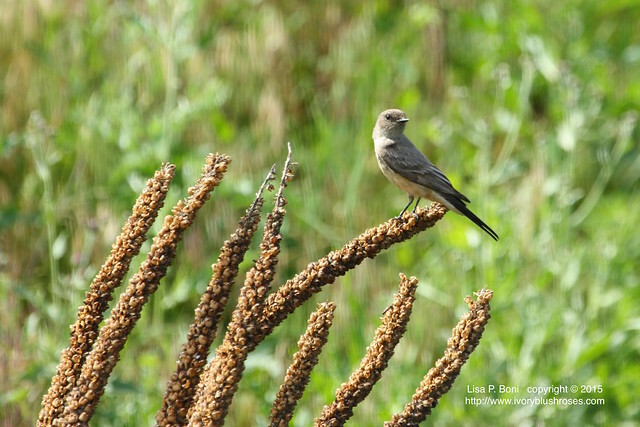 So graceful and posed so beautifully on last year's seed stalk heads! 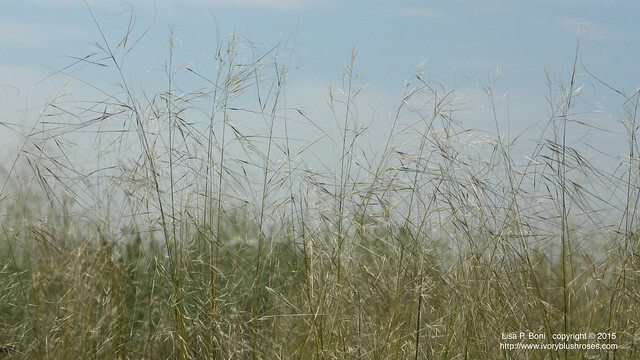 The dagger grasses are growing! I love how lacy and delicate they are against the sky. But walking through those grasses... beware! The little dagger tipped seed heads loosen at the slightest touch and have tiny barbs to work their way into any fabric (or skin!) that brushes against them! While I was visiting the refuge, I remembered that my youngest son Zach and I were to go hiking the following day. The news had posted that there was a possibility of seeing the northern lights from the mountain passes, something that I have always wanted to see. Knowing he wasn't working that night, I called and we planned an impromptu camping trip in order to attempt to see the lights! 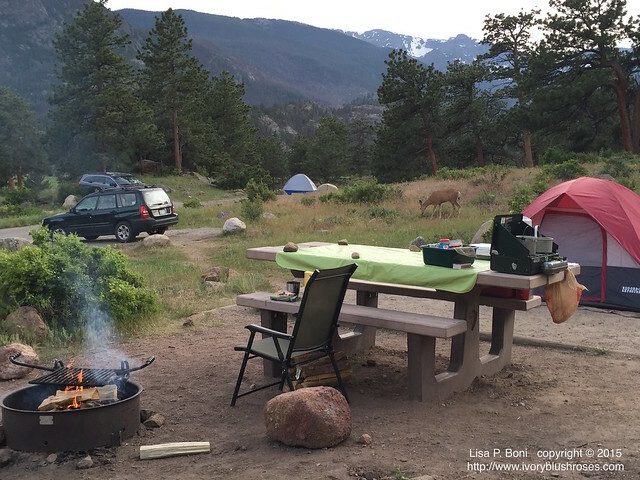 Being mid-week, early in the season, we were able to find a camping spot at the Moraine Park Campground in Rocky Mountain National Park! 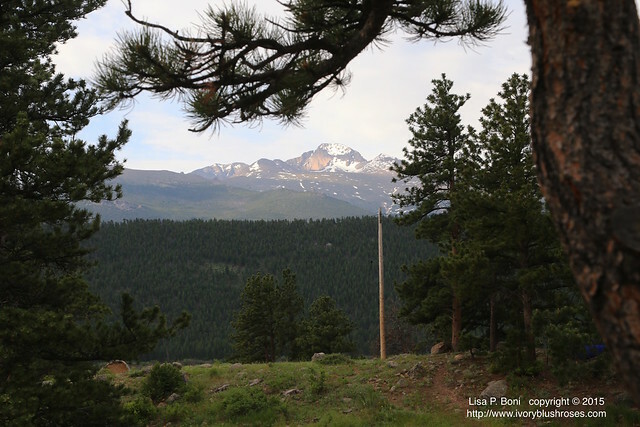 It was a lovely evening and we had a nice view of Longs Peak from our campsite. We watched a Mule Deer around our campsite for a while. 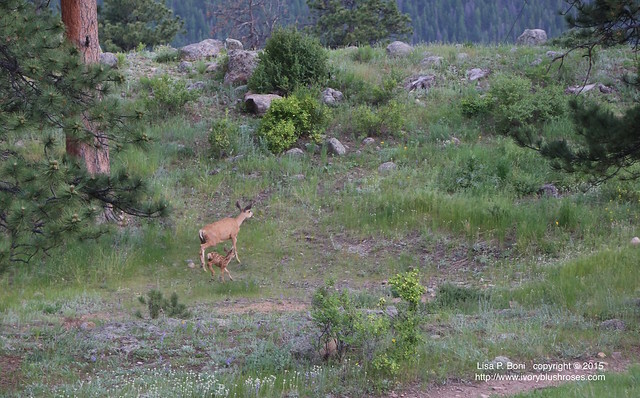 Then suddenly she made a little call and leaping to her side was a tiny fawn, still in spots! I'm certain it had been in hiding very close to us the whole time! We enjoyed our dinner (chicken apple bratwurst - which was yummy! 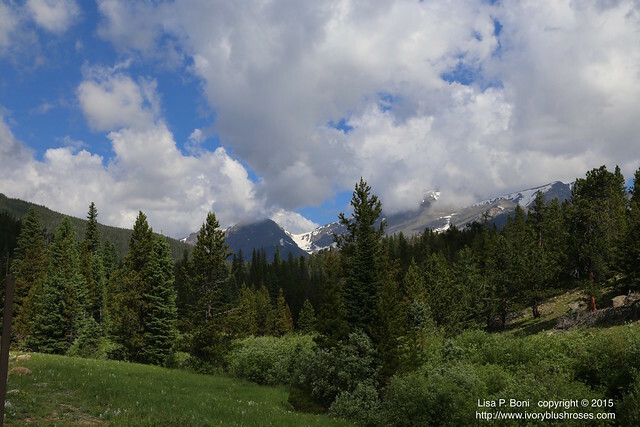 ), enjoyed the evening light through the trees, and then we gradually made our way up Trail Ridge Road where we found nice view of the northern skies. Unfortunately, as evening fell, so did the clouds, so even if there were northern lights, we weren't able to see any. It was a lovely adventure anyway! 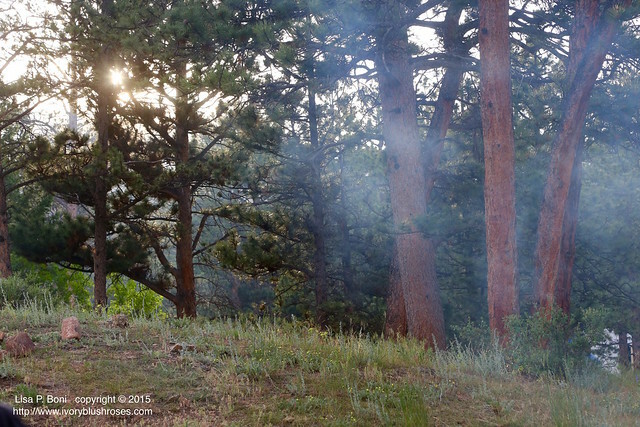 The next morning, we rose early, took our time fixing breakfast on the camp stove and packing up our gear. Zach had some afternoon appointments and so we just did the short walk around Bear Lake. So gorgeous and one of my favorite spots! Zach captured a decent photo of me! 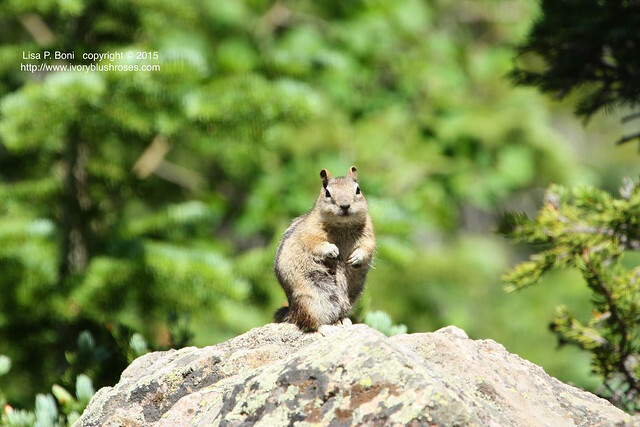 The Golden Mantled Ground Squirrels are in abundance throughout much of Rocky Mountain National Park. Such posers! Always looking for a handout even though people are not supposed to feed them. Love watching them and their antics! Another view from Bear Lake. This is the same view that is on the back of the Colorado Quarter. 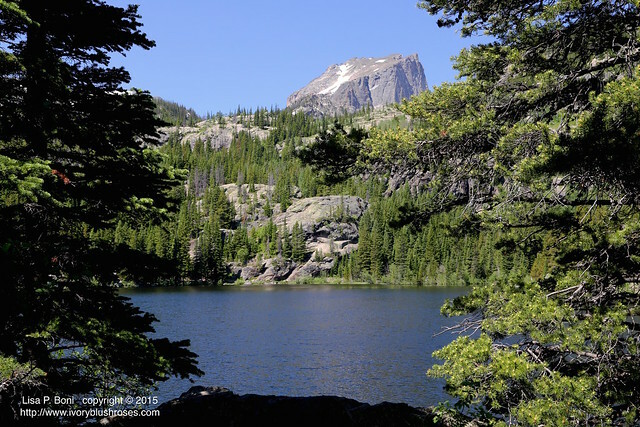 The tall peak on the left is Longs Peak and the notched ridge to the right is known as "the keys". The Globeflowers were in glorious bloom! They loved the damp side of the lake! I loved how this tiny pondlet next to the main lake was like a mirror, while the lake itself was well rippled with the wind. Like a magic gateway to an alternate universe. Certainly a fairy realm if ever there was one! 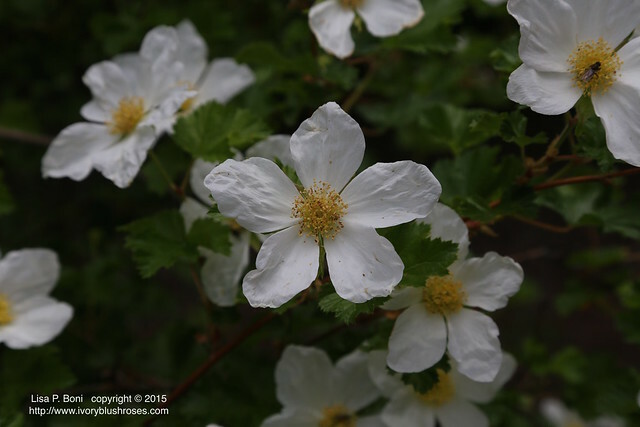 The wild roses were blooming like I've never seen them before! Such lovely large blooms in great profusion! Would love to add some of these to my garden! I opted to stay a second night on my own and once again was lucky enough to find a campsite! 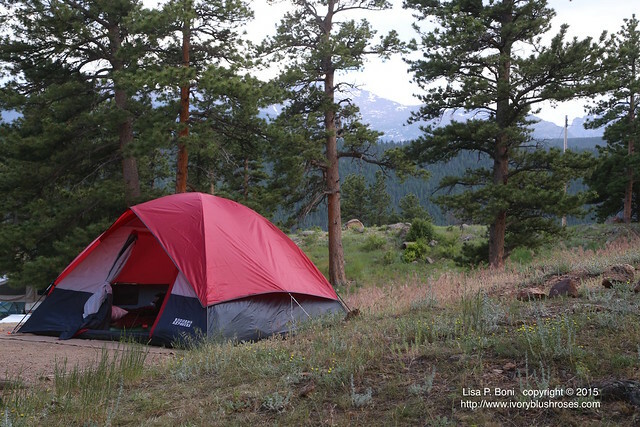 After the 4th of July, it will be next to impossible to find a campsite, so I was very happy! Even happier when Zach stayed around long enough to help me set up camp! 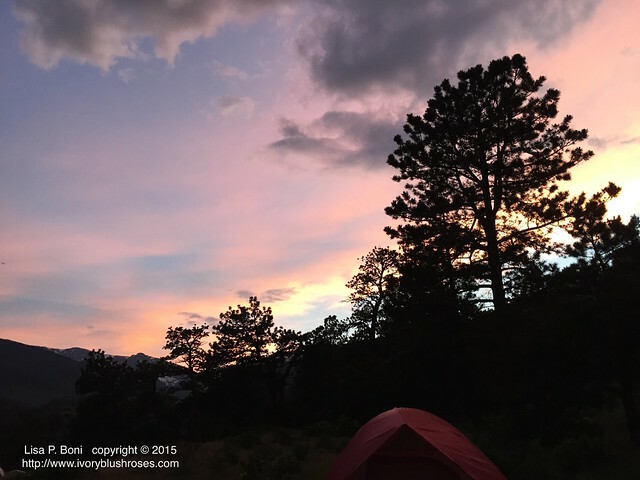 When I took this photo in the evening, I was visited by yet another mule deer! 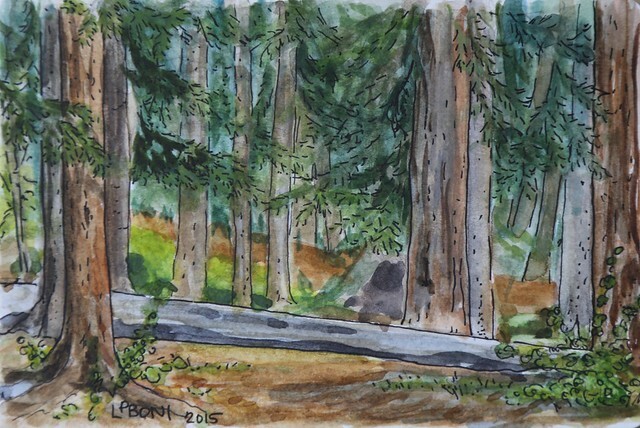 After setting up camp, I went out wandering the park and did several watercolor sketches. This one was of the woods at Endo Valley Picnic Area where I stopped to eat my lunch. Love these deep woods and the spots of sunlight that come through and light up areas of the grass. Little islands of citron colored glades hidden in the dark forest. 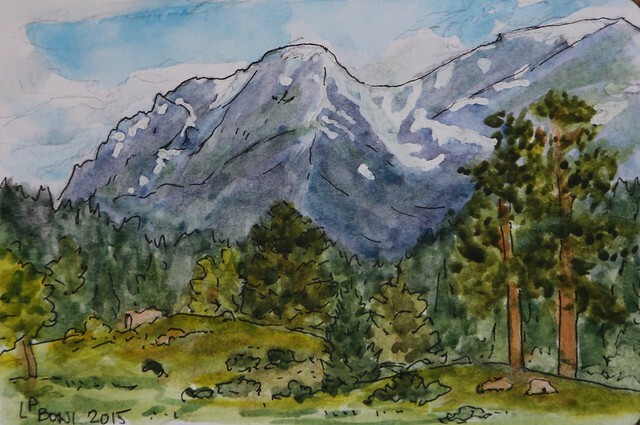 This is perhaps my favorite watercolor sketch ever. I remembered that I had packed along some watercolor mask, something I have been wanting to learn to use. It helped to keep bits of the paper a bright white and I could apply paint with abandon and yet preserve them. 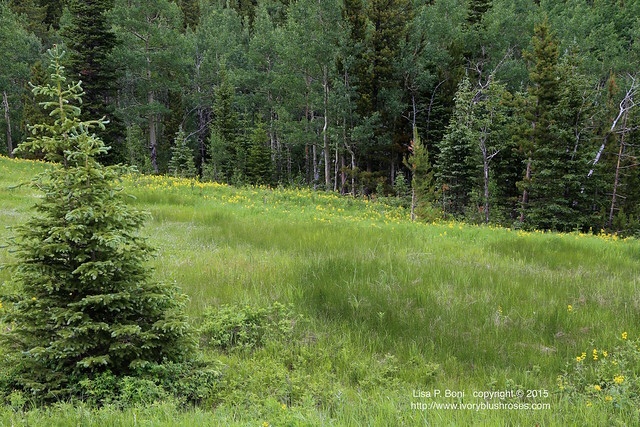 This meadow area, adjacent to an aspen grove has long been a favorite spot. 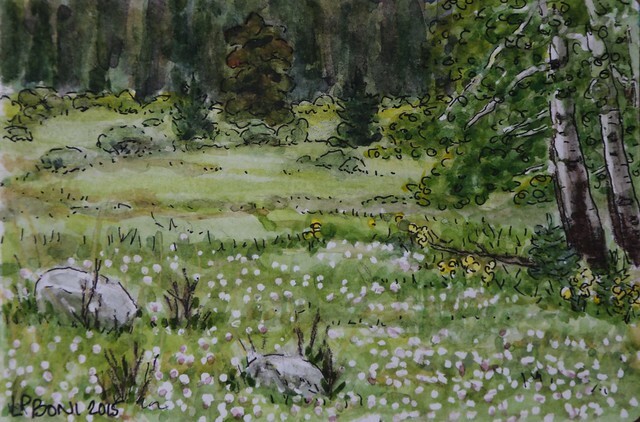 I've painted it before in oils, though I didn't include the meadow. At first, I thought all those little pink tinged white flowers were clover blossoms, but they turned out to be a type of tiny aster growing among the grasses. I also stopped at another favorite spot at the west end of Horseshoe Park. The valley ahead is Endo Valley and the picnic area is at the foot of the mountain shown. Truthfully, this is my least favorite sketch of the day, and as I look at it now, I see where I could do some things to improve it! Regardless, it was a wonderful afternoon of sketching and I am so very grateful to have had the time and opportunity to do so! 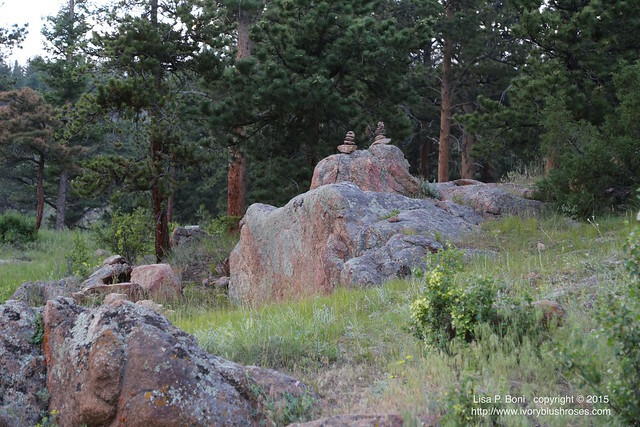 At my campsite, I enjoyed the rock cairns that someone had built. They seemed very fitting somehow. The sunset was lovely with the sky all shades of pink, peach and lavender! I ate my dinner by the campfire and enjoyed the stars and moon and watching the campfire glow until I'd used up all the wood we had brought. What a lovely evening to simply sit and enjoy this lovely world that God has created! 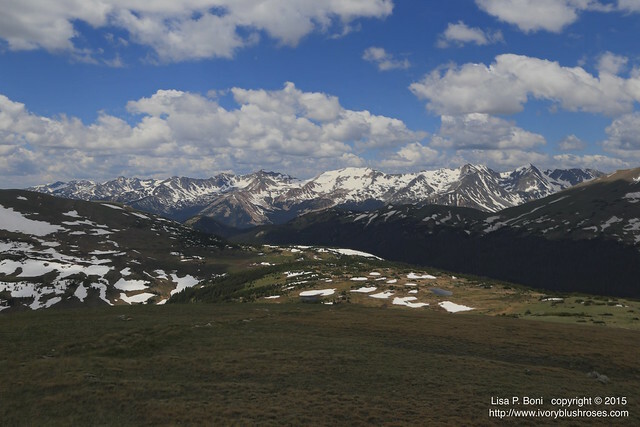 After packing up camp the next morning, I decided to drive up Trail Ridge Road again ~ this time in the daylight! The sky so blue and the clouds so white! Just magnificent views of the mountains and forests! 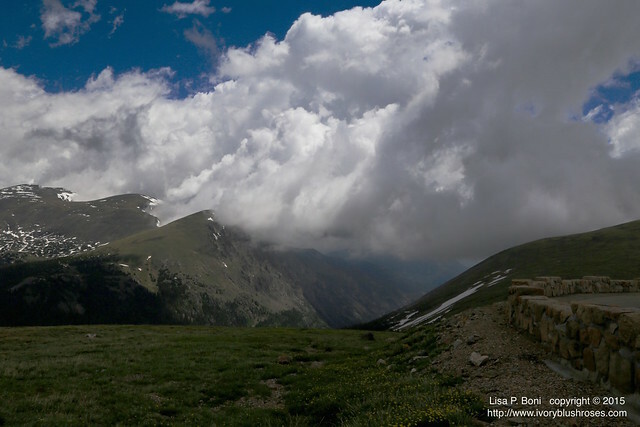 At the top of Trail Ridge, I was on and even level with the clouds! Spectacular views! There was beauty at my feet as well! These tiny white flowers might be all of ⅛" across! 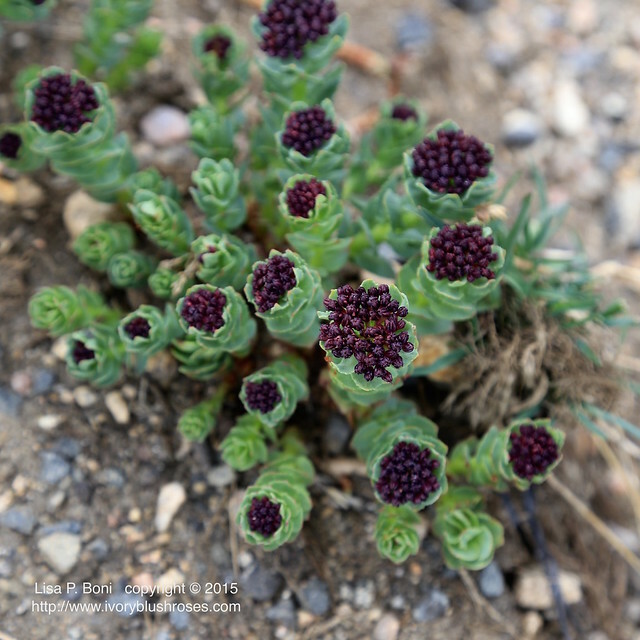 The buds of these flowers, not yet in bloom had an otherworldly look to them! Fascinating! The mountain peaks, still bearing a good coating of snow were simply magnificent! Years past, the kids and I hiked from the valley below, up across this ridge that you see in the foreground and to the Alpine Visitor Center (out of view to the right). It was quite a hike and one we all have fond memories of! 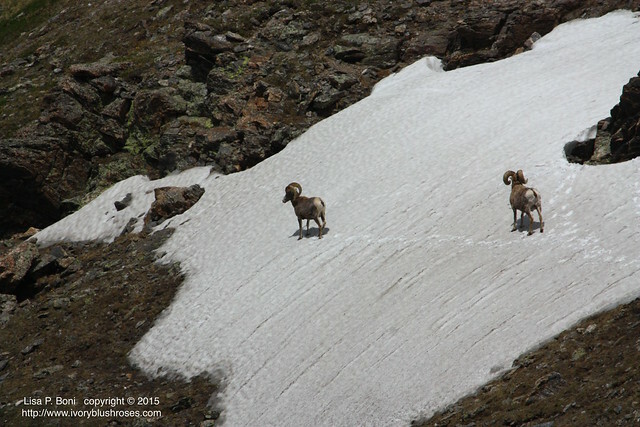 One of the day's treats was watching these two Bighorn Sheep rams crossing the snowfield! 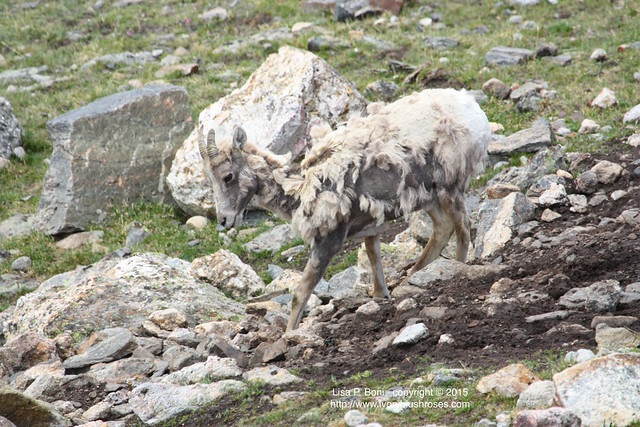 Not far away, this ewe, still shedding her heavy winter coat, was nearly invisible as she blended in with the rocks around her. That patch of brown dirt must have some mineral or salt that she craved as she stayed for the longest time, licking and tasting! Another well camouflaged resident of the tundra that I always love to see was the Pika! 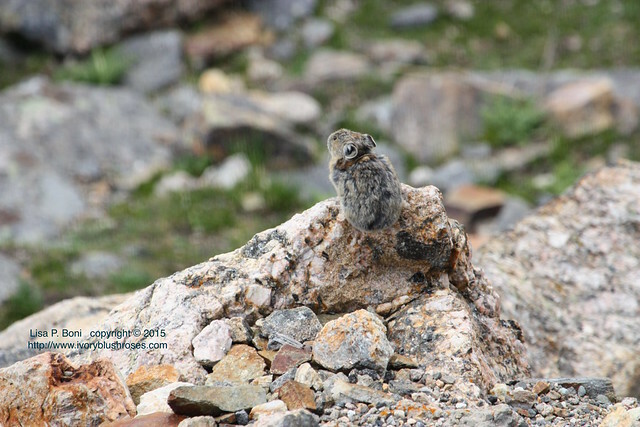 Smallest member of the rabbit family, it lives at these high altitudes all year round. All summer long, it is busy harvesting plants and creates little haystacks of food for the times during the winter season when it comes out of hibernation. 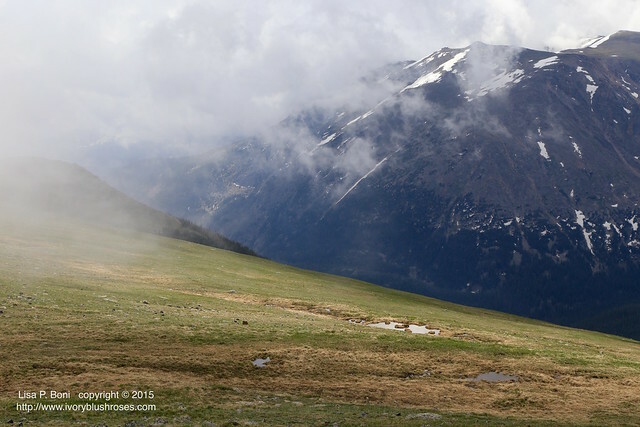 As I headed down the mountain, the clouds lowered and covered the peaks. In the lower levels of the park, the meadows are incredibly lush and green, filled with wildflowers, insects and birds! 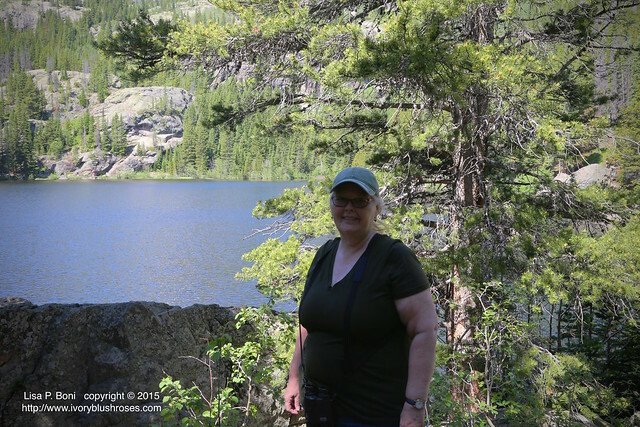 I spent two days and two nights in the park and just a few hours at the Refuge, but it felt more like a week of rejuvenation! Truly a blessed time! Your photos are incredible - you live in an amazing area. Thank you for sharing your sabbatical with us. What a magical camping trip that was - I would give anything to have been there. Your pictures are magnificent and made me feel like I was on a wonderful journey. I love your watercolors - just another one of your beautiful creations. Thanks for sharing Lisa! Lovely post and if we were photograhed together we could be sisters. Interesting heh? Love your sketches and thank you for reminding me I like to draw and paint as well. For that most grateful! Great post your pictures and drawings are wonderful!! Your watercolors are really amazing. 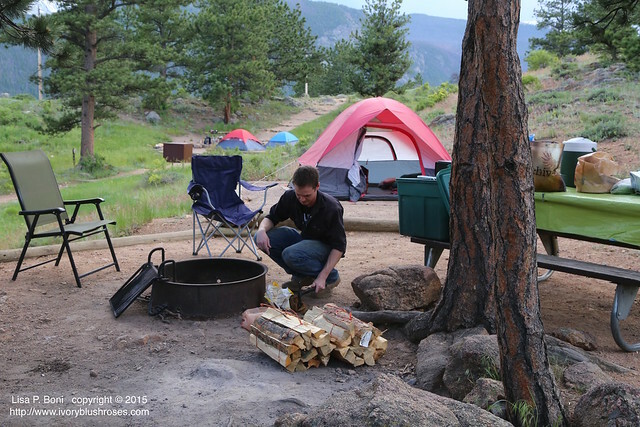 The photographs make me feel like I could be standing there enjoying the view and smelling the nice campfire, too! Wonderful, thanks. Thank you for all the time it took to post your wonderful photos and drawings/art. I enjoyed all the detail and everything you wrote about. I was so surprised to read you stayed another day by yourself and didn't write you were afraid at all. Thank you so much for sharing. I look forward to each and every post! Lisa I love your post. 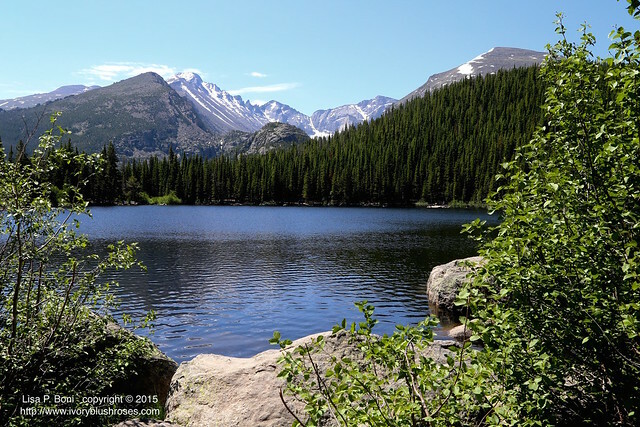 Colorado is another state I want to visit one day, and your beautiful photo's and paintings make it even more of a determination in my mind to see. Thank-you so much for sharing that beauty with us. I've been trying to get my family to go camping again, with no luck. You have convinced me to just pick up and go, and enjoy the solitude and beauty that God has offered. Bless You! I lived in Colorado several years and still have family there. This was a beautiful reminder of many happy times. You also remind me to get out my watercolors again. I'm so impressed!!! Staying overnight by yourself--wow!!! 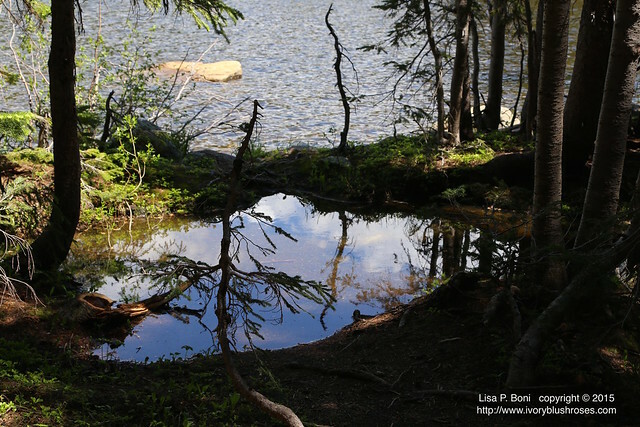 Your photos and captions are always a delight, Lisa. So glad you had that time for yourself--and to also share with your son. As an aside, what kind of camera do you have...or is that beauty totally in the photographer's hand, and God's of course!